Poor fourth years… you’ve applied, you’ve been interviewing, you’re exhausted and it’s already time to start making decisions about which program is your favorite. Odds are good you’re currently struggling to choose who to put in the number one slot. Take a deep breath, relax. You’ll make the right choice, because this post will help you figure it out. In the Family Medicine world it’s not quite as intense as it is for other specialties, and you’re likely to Match into one of your top three programs. 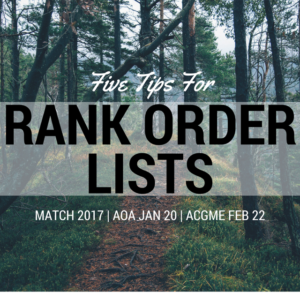 In Match 2017, the AOA/NMS ROL is due January 20th, while the ACGME/NRMP ROL is due February 22nd. With one to two months to plan, there is more than enough time to complete your remaining interviews and consider your options. Below are my five tips and a wealth of suggestions from others on the topic. If you love a program and felt comfortable at your interview it’s okay if you can’t clearly explain why it’s “better” than Program B or C on paper. My ROL changed 20 times in a single night, and I kept thinking I should put a really great East Coast program in the #1 spot. It met all the requirements I was looking for at the start of the interview cycle… but I kept wanting to put a different program in my #1. See ‘Choosing a Perfect Residency’ below. My top five residencies are all amazing programs, and I would’ve received a great education and developed friendships with the family of residents at any of them. However, intern year is brutal. If you felt happiness at a particular program, whether it’s got lots of independent book stores or has great hiking, rank it higher. Those intangibles have weight and should be considered, because your days off will be precious and you want to be able to have fun after your nap. Rank order is YOUR order. DO rank places that seemed to like you, but DON’T let that decide your order. Your number one should be the place YOU most want to be at, not the place that you think liked you more (unless they’re the same). It doesn’t affect your chance of Matching to list a “reach” as your top choice (see our post on the Match Algorithm for proof), and if you do Match there it’s the perfect situation. See UW’s Talk is Cheap link below. When you’re finally putting together your ROL don’t neglect the where, especially if you have children and a chance to be near extended family. I spent most of interview season with three AZ programs trading spots at the top of my list, because being back on the West Coast and closer to my family mattered. However, after interviewing at a program in the city they’re in I ultimately ranked the the program closest to home much lower, because it didn’t meet my happiness requirement, and I don’t have any kids to consider. Don’t list a residency you don’t want to Match to. The last program on my ROL had residents I didn’t click with very well, but felt I could happily work with for 3 years. If you can’t imagine that, DO NOT rank the program. That said, not matching is not a good place to be in, resulting in Scramble or SOAP. You’ll have to decide if a place you interviewed at is so malignant you’d rather risk another cycle of applying and interviewing than spending three years with them. Be sure to book-mark this post and re-visit the night before your ROL is due to read this line: NEVER MAKE LAST MINUTE CHANGES TO YOUR ROL. That’s all the advice I have today, but there’s some great information listed below, so enjoy the links. KevinMD: Choosing a Perfect Residency – This is a MUST READ article, explaining exactly what I mean by going with your gut. Read it right now. UW Dept of FM Four Tips – Brief and to the point. The last point regarding ‘talk is cheap’ is a must read. AAFP’s Residency Selection Tips – Short and to the point. NEJM’s Choosing the Right FM Program – A more detailed discussion with great information (pie charts!) and recommendations. Worth the time. UC Family Med Tips for Fourth Years – General tips, more useful before starting the Match process. ALiEM’s Top 10 ROL Tips – EM focused, but still has relevant points. DIT’s ROL Tip – You need to rank enough programs to Match.